The entire caregiver team at Country Lane Pet Resort is committed to making sure your pet has a healthy and fun visit while you’re away. We also want to make sure you have total peace of mind so you can enjoy your travel and not worry while your away. For those of you who may be considering Country Lane Pet Resort for the first time, some of the most comforting feedback is to read the opinions of others who used and experienced our commitment and level of care. Take a moment and enjoy their candid feedback. Below are two opportunities to provide us feedback. While your memories of your last visit are still fresh and if you wouldn’t mind, please take a moment to send us an email with your comments and share with us your experience. Whether you are an Angie’s List member or prefer to just email us, we value your opinion. If you have not used our services before and simply interested in reading what our clients are saying, there are plenty of testimonials for you to review. Are you an Angie’s List member interested in posting feedback on your experience at Country Lane Pet Resort? Or, simply want to read what other Angie’s List members are saying about their experience? 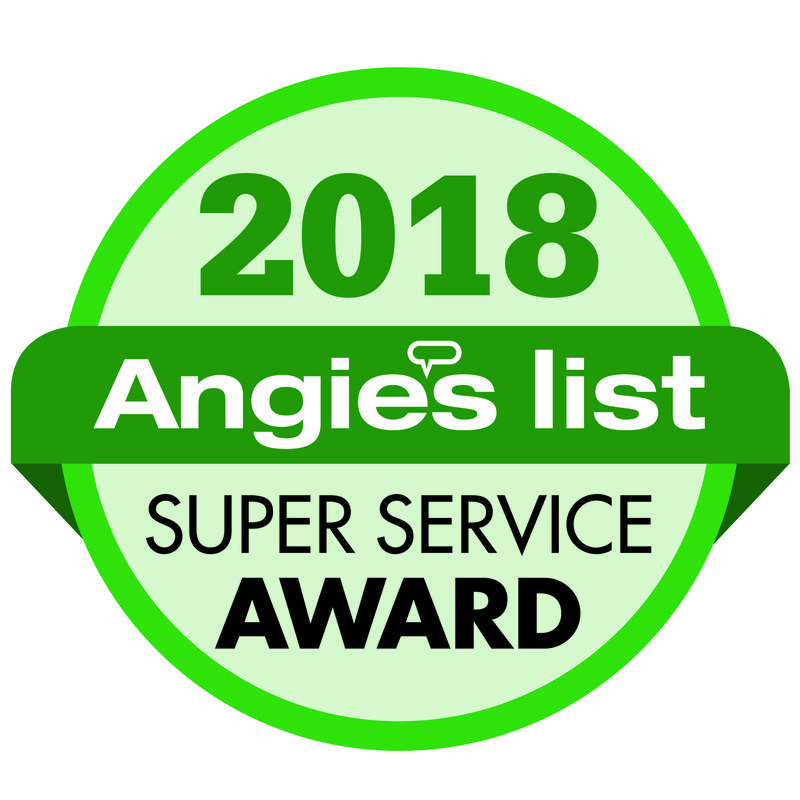 If so, please click on the Angies List Super Service Award Bug and follow the prompts. You do not have to be an Angie’s List member to share your experience. Just click on the link below. Please tell us how we did. Click HERE to give us feedback. I know its been a few weeks since Mia & Olivers stay with you, and I meant to write this after their stay while I went to Hawaii, but I wanted to go ahead and do it now while I am thinking about it. I am someone who is over-protective of my pets, and I will not leave them with just anybody. I had a lot of anxiety about boarding them while I visited my brother who is in the Navy and stationed in Honolulu, so I did a lot of research, and asked a lot of people for references. I am SO THANKFUL that my vet recommended Country Lane Pet Resort! I was told that my pets wouldnt even want to come home, because they would have such a great time, and that was definitely true! I was immediately impressed by the facilityit felt like a family campground! The genuine care and concern expressed by your staff made me feel immediately at ease, and I was able to enjoy my vacation. You didnt even mind when I sent a couple e-mails along the way to check in on them J I have attached a picture I took the day I picked them up after my most recent trip to Cleveland. They had just enough energy to jump up on my bed and fall asleep while they were smiling! That tells me they definitely had a great time while they were there. I would highly recommend Country Lane Pet Resort to anyone who needs to have their dogs cared for while they are out of town. They will be treated just like family, and will think they are on a vacation of their own! I cannot say enough about you, Mary and the entire crew at Country Lane Pet Resort – they have cared for, loved on and been part of Bauer’s lab life the past 3 years and they’ve been awesome. From taking care of him on short notice, to managing medications and reporting on him to our very sad son (who missed his Bauer buddy terribly) via email, it’s been a true pleasure to make our way out to Country Lane Pet Resort each time we needed to leave town. It makes me very emotional when I think of how comfortable I am leaving Bauer with them, and in what great shape (complete with a bath!) he always returns. I am so sad to leave the Cincinnati area, and Country Lane Pet Resort. They are the BEST. Truly irreplaceable in the care of our family pet. In all the places we’ve lived, we’ve NEVER come across a more caring and personalized service than Country Lane Pet Resort. Thanks, Randy. Bauer will miss you, and we as a family will miss you and your caring ways even more. It is very difficult to go on vacation when you own a wonderful dog who has developed Diabetes Insipidus. This disease requires timed medications twice a day, causes the dog to be thirsty constantly, urinate frequently, and have serious separation anxiety. The separation anxiety results in non stop tail wagging, which often causes an injured tail. So how do you take care of a wagging bloody tail? When you are CLPR, you get ingenious and devise a bandage made from a foam rubber hair curler and vet wrap……the result of which is a saved tail! In case anyone reading this has forgotten…a dog’s tail is part of its spine so damage to it is not a good thing!!!! Where other kennels simply look at an animal as a profit product, you look at an animal as a beloved member of your own family. CLPR took care of the tail and all the other needs and never asked for an additional fee. It should be noted that you were sold out that week, so you certainly did this on overtime. And when I returned from my trip, you made light of your extra efforts by having a “all part of what we do” demeanor! Darrell Dawg is a marvelous pet who has warmed the hearts of all he meets. I miss his healthy years terribly, but I still see in him a wonderful, loving, dear sweet dog. Thanks so much for seeing that too. Randy and staff, you are such caring people….very rare in today’s world. I really appreciate you and thank you. I wanted to let you know that Shannon and I have been nothing short of thrilled with the care you and the team provide Bella and Macy while we are out of town. They come home happy, healthy, and best of all tired! I cannot begin to tell you how impressed we are with the care our dogs receive at Country Lane. We have never been more comfortable leaving them and we have the utmost trust in you and your team. Mary is always great with follow ups and gives detailed updates on how the girls are doing while they enjoy their stay. As I said earlier, we could not be happier with all you do. We will continue to recommend Country Lane to all of our family, friends, and colleagues. Your team is GREAT. Thank you again for all you have done for our girls. Our experience was above and beyond what we expected. The owner and staff are to be commended. One of our two dogs to be boarded had been diagnosed with lung cancer days prior to our trip and we were not ready to put him down or cancel our trip. Country lane went far above and beyond what was expected and they administered medications to our sick shepherd. They also fed Alex cheese to get him to take his medication. It is obvious upon meeting and through subsequent interactions with the owner and staff that they are truly animal lovers and take good care of the pets that reside there. We will surely be returning when we need their services again. I want to send you a “Thank You” for taking care of Indy while we were out of town. Hopefully his next day in June, he will be a little better adjusted. I feel very comfortable with him staying at your “resort”. Everyone there seems genuinely concerned about the animals and about Indy. I feel that all the dogs get personalized attention and that makes a pet owner at ease. It is not like the animal can tell you if something is wrong. Well, they can in some ways. It was very nice that Indy stayed in the office while he waited for us to arrive. Thank you for accommodating us since we were a little late. I greatly appreciate it. 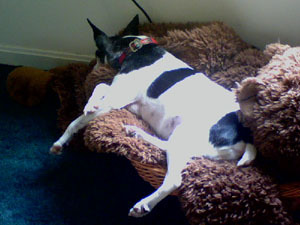 Enclosed is a picture of Lucy in one of her beds.She is napping after I walked her this morning, and I have to say that your exercise regimen seemed to put some zip in her step. I really appreciate the level of personal care that Lucy recieved during her stay. The staff at Country Lane really went above and beyond for my dog, who is indeed my best friend. Me and Lucy have been through alot together, I couldn’t trust her even with any ol’ body. She was a little confused going home, (she is pretty old after all) but once home she was back to her old antics. I am writing on behalf of our corgi, Rhymney, who refuses to type his letters on a computer. Thank you very much for taking such great care of him during our trip. As you know, he had never before spent overnight at a kennel in his 10 years, so we were a bit concerned. When we picked him up after a week with you he was clean, happy, and his normal self. He showed no signs of anxiety and returned to his old habits as soon as he got home. The highly professional and caring philosophy you describe in your website understates the care you provide. My wife and I selected Country Lane because we liked the fact that you think of things from the dog’s perspective. I think Rhymney would agree. Jennifer and I are delighted by how you and your wonderful staff treated Rhymney, and us. It was very comforting to get word from you early in our trip that Rhymney was doing well. It made our vacation that much more relaxing. We are already thinking of more trips, so you will be seeing more of Rhymney in the future. Chester, Levi and Amelia Jane wish to say “Poochas Gracias” for the fantastic care they received at Country Lane — and so do we. It’s always stressful to leave our babies, but we knew they were happy and well cared for in our absence. The fact that Chester was jumping up on you and Mary and giving both of you kisses is truly a testimonial. Chester is our “old curmudgeon,” and he can be a bit stoic. He obviously was very happy at Country Lane. Thanks for making our time away from our babies worry free and wonderfully fun for them. I am so pleased I have a place where I can leave Loki and know both as an individual and as a representative of a breed, he will be treated as an individual of that breed. Speaking as Loki’s “person”, it was reassuring to know this. It was obvious when we reconnected, he had a great vacation with lots of dog interation and people contact. Both of which are so important in order for Loki to continue to be a well rounded, mannerly dog. Thank you for operating a place where a dog can be a dog and enjoy a “spa” vacation. Thank you so much for the wonderful care Heidi got when she stayed with you. I never worry when I leave her with you, I know she is in very capable hands. I do want to thank Mary for calling, after we got home, to let me know about Heidi and her nose. I had seen her nose and knew what happened, she’s done this before. I told her she needs to keep her nose out of other people’s business. I do appreciate Mary taking the time to call. Thought you might like to know, I think she was missing all of you after she got home. She would not eat for almost 2 days and she kept looking around like she was looking for someone. Maybe that someone was the person that really spoils her, possibly Mary…….I Love it!! It is nice to know that she enjoys being with all of you. When we pull into your drive she is ready to jump out of the car, she knows where she’s at. She loves being at “doggie camp”. Thanks again for the wonderful care and also for the thoughtful call to let us know what happened with her nose. Other than family, I will never leave her with anyone else. I have also recommended you to anyone that will listen. I know one neighbor has already contacted you. Another neighbor is the one that told me about you, good news travels fast and far. Keep up the good work!! We want you to know that we appreciate the great care you and your staff have given Angelica when she stayed at Country Lane. [We call it her going to Doggie Camp] She has stayed with you for the last three times we’ve gone on vacation, and our vacations have been more enjoyable because we don’t worry about her. [We miss her, but don’t worry about her] We are so thankful we found Country Lane. We drive about one hour to get there and would gladly drive twice that far. Randy, I just wanted to thank you for taking such good care of Rusty for 10 days in April. This was the first time we left him, and I have to say we were nervous about how he would do. The thought of him locked up in a cement run all day didn’t appeal to me. I was so glad I talked to you and brough Rusty out for a 1-night trial run. I really liked how you are set up and how friendly everyone was. When we cam back for his real stay, he already knew the place. Everyone was great and I know that Rusty was very happy. He actually seemed sad to leave. We had to leave him for 2 nights recently at another kennel (short notice) and I could tell a big difference. He did not like this place at all and couldn’t wait to leave! We will definitely be bringing Rusty back and know that he is in good hands! I must admit that I have always been impressed each and every time we’ve brought our Siberians to you, but this time really takes the cake. I feel that I care a great deal for my Huskies, but to be honest, I can’t say that I’d run out to the store, buy a chicken and some rice and then cook them up a special meal because of one soft stool!!! 😉 I can’t imagine any other kennel even noticing such a thing let alone doing anything about it. The care you have shown for my dogs has gone above and beyond what I could ever expect from any kennel. Misha and Tuvok are extremely fortunate to have such wonderful care near our home. Well, you’re not exactly near our home, but an hour drive each way is well worth it in our opinion. Your service, flexibility, responsibility, and most importantly, your care giving has always been the absolute most professional we’ve ever seen. We thank you for all of that. We thank you for all that you’ve done. We thank you for all that will continue to do for us and our dogs. You are truly astounding at what you do, and we can’t thank you enough! The turning point came in March, when our dear pet sitters were busy, and our teens we had used in the past had found a social life and no longer dog-sit. Through the doggie grapevine, I found out that 3 of my friends AND my vet LOVE Country Lane Pet Resorts. But how on earth could we expect our dog who is used to 6 miles’ worth of walks a day and a dog who sleeps on couches and beds, go to a kennel? No way!! Our dog is used to TLC 24/7 and a kennel could never take our place with all of the love, attention, and comfort we give our pup… or could it? Her tail couldn’t have been higher when I looked at her interaction with the staff as I picked her up this weekend. Thank you so much for loving my dog and making her happy… it’s exactly what we both needed!! I just wanted to compliment you on the service we received at Country Lane. I have to admit that dropping Gracie off on Saturday was harder than I thought, I was a bit sad but knew that she was in good hands and we were making the right decision. Country Lane is located in a beautiful setting and you and your staff were great. It seemed as if you knew what was going on with each and every animal that were there. I can call to check in on her from our honeymoon right? Boomer & Lady really did swell at your place last week. NO problems when I brought them home. When I picked them up after their overnight last week, it was evident that Lady was a lot more comfortable in her vacation surroundings. Mary was so very nice and sweet with my pups. Thank you all for all your caring and your generosity. We will never, ever forget what you have done. 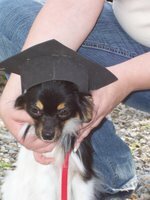 Graduates from an Advanced Training Class held at Country Lane Pet Resort celebrated their graduation at The Home of Bluebill Retrievers and took their Canine Good Citizen Test, CGC, which was given by Vicky Fairchild of Marjon Kennels, Batavia, Ohio. It was a beautiful day and we had lots of food and plenty of doggie fun. One of the students was so excited about the pond that he had to take a dip before the test and therefore had to have a little grooming before entering the ring. After they passed their CGC test we had “rain” along with dinner and everyone had to move indoors for the remainder of the evening. Below are pictures of the graduates. 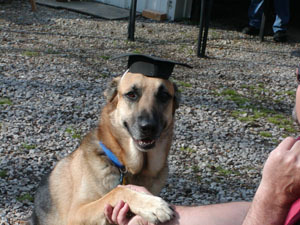 I wanted to let you know what a great experience Mac and I had with Connie French’s CGC training class at Country Lane. When we started the class, I had ownly had Mac about a month. We adopted him at age 3+ from a rescue group, a beautiful large german shepherd, and he had been abused and was very emaciated. He was extremely nervous and fearful, wouldn’t let anyone but me touch him, and was ready to bolt out the door at any time. After 8 weeks of work with Connie and Donna, he is a different dog. He passed the CGC test with flying colors. He allowed the tester, a stranger, to approach, pet, groom, touch his ears and feet. He stays on command for any length of time, did not startle with loud noises or distractions, can walk through a crowd, heels on a loose lead, and stayed with a stranger while I was out of sight for the required 3 minutes no problem. What an accomplishment for an abused and abandoned adult dog. I attribute this change to the gentle and calm training that Connie and Donna provided, and the opportunity to spend non threatening time with other people and dogs. I consider him well socialized now, and look forward to some further training. I urge anyone who would like a well balanced dog that can be taken into any social situations to take this class with Connie. Thank you for providing a great facility, and staff, for our classes. Randy, I wanted to let you how much Eddie and I enjoyed and benfitted from the Canine Good Citizen Class that was run by Connie and Donna. Eddie came out more well behaved and obedient I really appreciated the one-on-one instruction that was available from the instructors and they obviously took a personal interest in their students. It was great. My husband Jim & I just finished an 8 week session with Ruth for our Australian Shepherd puppies Scout and Ranger. Ruth’s love of animals and her expertise were evident from our first meeting. We had signed up for the class a week late, and she came to our house to meet our puppies and introduce us to the program. That was an unexpected and much appreciated gesture. Ruth has the ability to relate to the dog owner, how dogs process information, and what is the most optimum way to get the behavior that we want to insure a healthy and happy relationship between puppy and owner. Our puppies did very well learning basic commands, and I feel that we have a solid foundation that will enable these active pups to become a great addition to our canine family. Our puppies loved the time they spent with Ruth, and began to get excited during the car ride to class. I would highly recommend any class that Ruth teaches, as I know that her love of animals and extensive knowledge are an asset to any pet owner. Scout & Ranger say Thank You, Woof Woof (especially for the goody bag), & Jim & Lisa thank you too.